Stop the Bleed is a national program intended to encourage people in our communties to become trained, equipped, and empowered to help in a bleeding emergency - before professional help arrives. Fire District 8 members provide Stop the Bleed classes quarterly. We encourage you to sign up for one of our free classes and learn to stop life-threatening bleeding caused by everyday emergencies. 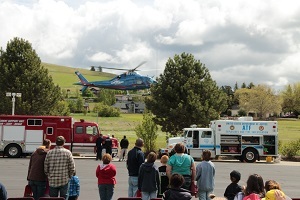 Our next Stop the Bleed class will be Saturday, May 18th, from 10:00 am - 12:00 pm, at Station 81, 6117 S. Palouse Highway. Please call 509-926-6699, or email admin@scfd8.org to register. Wow, what a turnout! 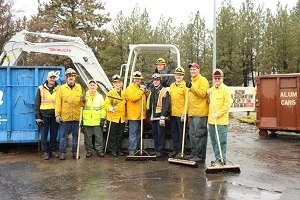 Thanks to all who came to Station 82 on April 13th with their winter yard and garden debris during SCFD8's annual Debris Collection Day. 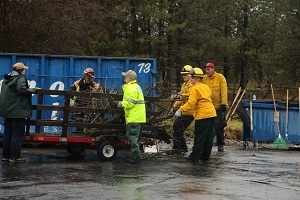 District 8 members were up bright and early ready to unload trucks and trailers full of brush, pine needles, and branches - and by the end of the day - four large containers were filled. 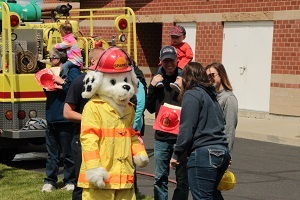 Our hope is that this annual event helps our neighbors prepare their homes for summer by eliminating the dry materials around their property that may catch on fire. We especially thank and appreciate those SCFD8 members who volunteered their Saturday for this worthwhile community event! Winter will soon be behind us (we hope) and with the arrival of spring we have a lot to share with you in the Spring 2019 edition of the Fire 8 Flyer. A sincere Thank You for your continued support and approval of our recent Maintenance and Operations Replacement Levy. Our goal to continue to serve you with the level of rapid response, equipment, and highly trained firefighters and paramedics that you have come to expect. This spring you will have an opportunity to participate in a number of workshops, classes, and community events. 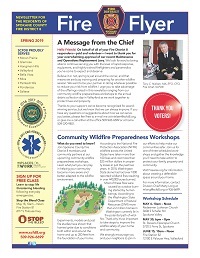 In this Fire 8 Flyer you will find dates for our Stop the Bleed class, Community Wildfire Preparedness Workshops, our annual Valleyford Debris Collection Day, and Station 81’s annual Open House. If you live in one of our rural areas and have not already requested a Home Address Sign – it’s not too late. If you have any questions about the services we provide for you, please feel free to stop by one of the stations or give us a call. 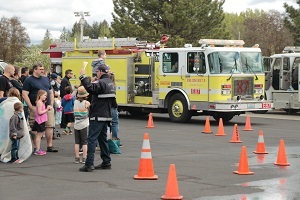 The Board of Fire Commissioners will hold their next regular monthly meeting on Tuesday, May 14, 2019 at Station 82, 12100 E Palouse Hwy, Valleyford, Washington, beginning at 6:00 pm. BoFC meeting agendas and minutes are available here. 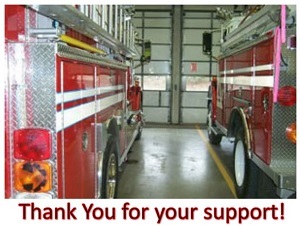 Thank You Fire District 8 community for your overwhelming support in the passage of our Maintenance and Operations Replacement Levy. With the passage of the replacement levy we are able to maintain a Firefighter/Paramedic at each station, respond effectively when multiple calls are received at the same time, as well as maintain volunteer programs and firefighter safety requirements. We appreciate your trust in Fire District 8 and we look forward to continuing to serve you with the level of rapid response, equipment, training, compassion and integrity you expect and deserve. We will always be here for you! 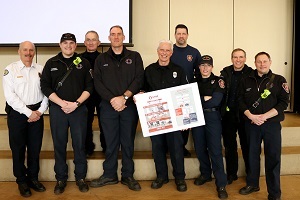 SCFD8 gathered on February 1st to the celebrate the achievements and successes of our members in 2018. The following people were recognized for their outstanding contributions: Shane Jenkins, Career Firefighter of the Year; Megan Williams, EMS Provider of the Year; Todd Ullrich, East Battalion Firefighter of the Year; Joe St. John, West Battalion Firefighter of the Year; Jonathan Sells, Resident Firefighter of the Year; Joseph Zarazua, Part-time Firefighter of the Year; Blaine Holman, Recruit Firefighter of the Year; Jennifer Raudebaugh, Recruit Firefighter of the Year; Jeff Wainwright, Fire Chief's Commendation; Kris Cress, Fire Chief's Commendation; Jake Hedben, Distinguished Service; and, Mason McCuddin, Commissioners Award. 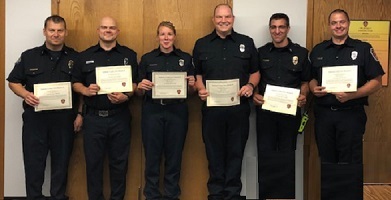 The following SCFD8 members were recognized for their years of service with Fire District 8: Oleg Gordey, 5 Years of Service; Damian Meyer, 5 Years of Service; Andy Rorie, 5 Years of Service; Zachary Searle, 5 Years of Service; Emil Derkach, 5 Years of Service; Jeff Sevigney, 10 Years of Service; Michael Metcalf, 10 Years of Service; Tom Chavez, 10 Years of Service; Bill Curley, 10 Years of Service; Shayne Hanson, 10 Years of Service; Pete Flatt, 15 Years of Service; Tony Nielsen, 15 Years of Service; Steve Bailey, 20 Years of Service; Kathleen Lundy, 20 Years of Service; and Ron Cato, 25 Years of Service. Thank you Chief Hatley for once again capturing the year with your 2018 Year in Review. 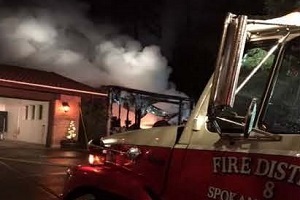 Spokane County Fire District 8 responded to a structure fire in the 4000 block of South Linke Rd. on December 11, 2018 at approximately 8:19 p.m. Units from Fire District 8 arrived within 4 minutes of the call and reported heavy fire and smoke from the front of a detached shop, which was approximately fifteen feet from the house. Engine 85 from the Saltese fire station was the first arriving fire engine and quickly started extinguishment. Water supply was a challenge, as there are no hydrants in the area. Water tenders also responded immediately to support the fire attack. Due to quick response and coordination of resources, the fire was confined to the shop. The home sustained no damage. Thank you to Spokane Valley Fire Department as a partner in automatic aid response and our volunteers that came in from home to help keep the fire loss small. 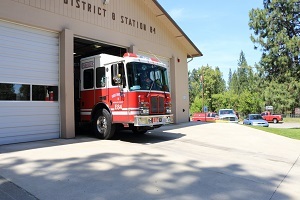 Spokane County Fire District 8 provides Fire, Paramedic and Rescue services to approximately 22,000 citizens over 110 square miles from 4 stations located in the Moran Prairie, Valleyford, Ponderosa, and Saltese areas. Each station is staffed twenty-four hours a day with a combination of career, part-time, and volunteer and resident volunteer personnel. 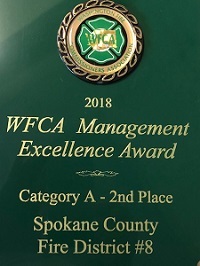 The Washington Fire Commissioners Association awarded Spokane County Fire District 8's leadership and management team with 2nd Place in Washington State for Management Excellence in category "A" class fire departments during their annual conference in Yakima on October 26th. WFCA designed the Management Excellence Program (MEA) to provide recognition to fire districts and regional fire authorities for their outstanding leadership, innovative ideas, and progressive achievements. SCFD8 participated against fire departments with budgets greater than $4,000,000, and has placed 1st or 2nd for the last three consecutive years. The Management Excellence Award Program provides a means of sharing information, innovative ideas and the variety of activities taking place throughout the state of Washington. In addition, the program provides recognition to those in the fire service who have demonstrated progressive achievement. MEA is a benefit to all fire districts and regional fire authorities in the state, regardless of size, location, budget, or number of personnel. Fire Chief Tony Nielsen said, “We are humbled to have been selected for this award. When you have strong citizen support and great members you can really create a high performing organization." 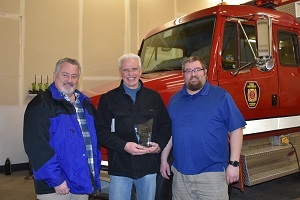 At the Washington Fire Commissioners Association annual conference in October, Commissioner Lee Boling was recognized for his 20 Years of Service as a Fire District 8 Fire Commissioner. Commissioner Boling began his service with District 8 in 1984 as a Volunteer Firefighter and Fire Investigator. He was elected and has served as Fire Commissioner from 1994 – 1999, 2004-2009, 2010-2015, and he began serving his fourth six-year term in 2016. Commissioner Boling brings a number of years of experience to the Board through his work as a trooper and sergeant with the Washington State Patrol, and with the Washington State Liquor Control Board. Thank you, Commissioner Boling, for your dedication to the fire service and to our community! 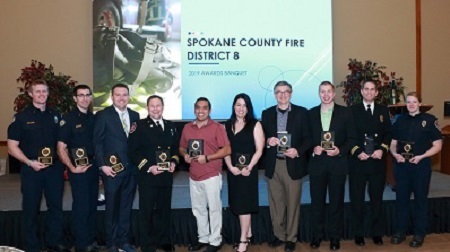 Spokane County Fire District 8 was recently named as one of the Best Places to Work Inland Northwest. 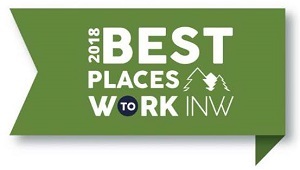 The Journal of Business and Best Companies Group created the third annual list of the Best Places to Work Inland Northwest. This survey and awards program was designed to identify, recognize, and honor the best employers in the Inland Northwest, benefiting the region’s economy, workforce, and businesses. The list is made up of 35 companies. Spokane County Fire District 8 has been named one of this year’s Best Places to Work Inland Northwest. The list-making companies will be honored at an awards ceremony on September 26, 2018, at the Davenport Grand Hotel in Spokane. The rankings will be published in the September 27 issue of the Journal of Business. On the morning of February 12, 2018, crews from E81, E82, and Spokane E14 were participating in a pit crew CPR training at Station 81. At 10:16 a call came in for a 31E EMS Echo; all three engine companies responded. Upon arrival, they entered the residence and found an adult female inside in full arrest. Captain Wood initiated timekeeping and recorder and spoke with the patient’s family to obtain information. Division Chief Hatley arrived and remained with the family to secure additional information. FF/PM Williams ran the incident on the EMS operations. FF/PM Mertens was in charge of airway. FF/PM Collins was in charge of drawing up medications for the medics. FF Flatt and Lt. Cress were in charge chest compression. All of the crews performed their assigned positions, and after several minutes they were able to get pulses back and the patient was transported to an area hospital. All were recognized at the Board of Fire Commissioners meeting on August 14th. Thank you all for your amazing work and for the life you saved! SCFD8 members spent their day at 57th and Regal on Saturday, June 2nd filling their boots for Muscular Dystrophy. Thanks to you, more than $8,000 was raised to help families, friends and neighbors in our area who are battling Muscular Dystrophy. From SCFD8 & Local 3711, Thank You for your generous donations! 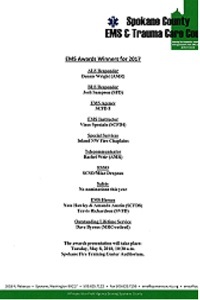 Lt. Nate Hawley and FF/PM Amanda Austin received the “EMS Hero” award, and Fire District 8 once again received the “EMS Agency of the Year” award. 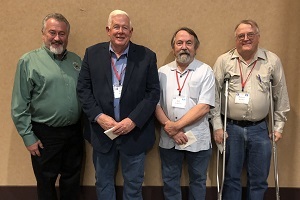 In addition, as members of the Inland NW Fire Chaplains, SCFD8's outstanding chaplains, Aaron McNally and Dave Simboli received "Special Services" awards. We are so proud of Lt. Hawley, FF/PM Austin, Chaplain McNally and Chaplain Simboli and all of the SCFD8 team who have committed themselves to providing the best possible patient care to those we serve. Well done! After an extensive review of Fire District 8's firefighting capabilities, water supply, emergency communications and fire safety control, the Washington Survey & Rating Bureau (WSRB) has upgraded the Fire District's rating from a Protection Class 5 to a Protection Class 4. The new rating will be effective May 1, 2018. Fire Chief Tony Nielsen said, "This is exciting news for Fire District 8 and our citizens. Thanks to the support of our citizens, we've spent the last four years making significant service improvements that now may also result in lower fire insurance costs for our residents and businesses. I encourage residents of our community to contact their insurance agents to see if this new rating will affect their insurance premiums." 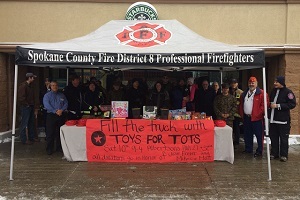 Thank you to all that joined SCFD8 members at Albertsons, near Highway 27 and 32nd, in Spokane Valley last December. Our local community generously donated many new, unwrapped toys totaling $7,000 for children in our community and helped to bring joy to hundreds of kids in our area. Since 1947, the U.S. Marine Corps Reserve Toys for Tots Program has collected and distributed toys to children providing a message of hope and assisting them in becoming responsible, productive, and patrotic citizens. Did you know your smartphone can help you save a life? 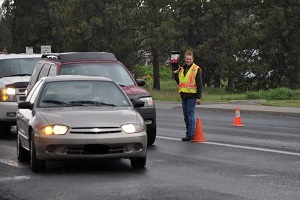 PulsePoint, a free smartphone App in Spokane County, enables subscribers who are CPR trained to be alerted to a sudden cardiac arrest at the same time emergency responders are notified. Registered users will be notified when a sudden cardiac arrest has occurred in a public place within their vicinity. PulsePoint will give the citizen responder mapping directions, notify them of any automatic external defibrillators (AEDs) in the area, and provide radio traffic of the emergency responders. Early CPR is the key if a sudden cardiac arrest victim is to survive. When a person goes into sudden cardiac arrest, their heart, brain, and other vital organs no longer receive oxygen. Researchers have found that without early CPR within the first 3 to 5 minutes, a sudden cardiac arrest victim’s chances of survival are dramatically reduced. The free PulsePoint app can be found in the Apple App Store or on Google Play. 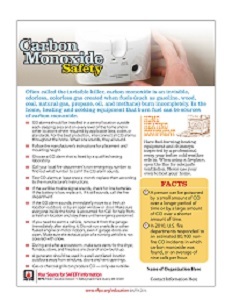 Keep your family safe by practicing these important Carbon Monoxide Safety Tips from the National Fire Protection Association. 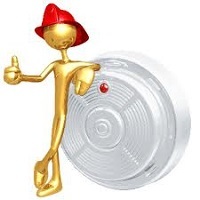 • Develop a home fire escape plan so that everyone knows two ways out and knows a safe place to meet. Practice your plan twice per year. Make sure your chimney is clean and safe for wood burning. Certified chimney sweeps can be found online and in the phone book. Keep combustibles a safe distance away from your fireplace or wood stove. 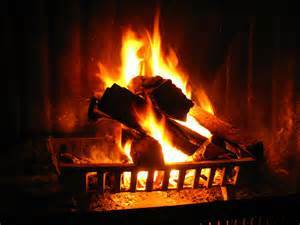 Burn only dry firewood or manufactured logs/pellets. Burning trash and other items is prohibited and can damage your wood burning device, lead to creosote build-up in your chimney, and produce toxic air pollutants. When burning, be sure to allow enough air to the fire to fully burn and not smolder. Avoid burning wood from the recent windstorm. This is "green" or "wet" wood and therefore provides little heat value and more creosote build-up in your chimney, which can be dangerous. 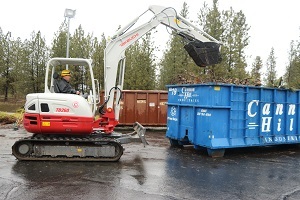 Windstorm debris may be taken to local transfer stations and the Waste-to-Energy facility, or it may be split, stacked and covered to fully dry for next heating season. Cold, clear and calm weather conditions are in the forecast for the next several days, which means there may be a build-up of wood smoke. If wood is not your only source of heat, consider cutting back on burning so that those who are relying on wood heat due to lack of power can stay warm and our air quality does not suffer too much. For more information on wood heating, please visit www.spokanecleanair.org/wood-heating. Know what’s below – call 811 before you dig. You may be surprised just how much is going on underground. Gas, electric, and other utility lines are just about everywhere. Call before you dig to locate underground utilities before launching a project. 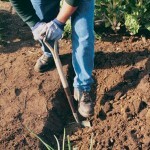 For your own protection, state law requires you to call at least two working days before you start digging. Don’t smoke, light matches, turn your electrical switches on or off, use the telephone, or do anything else that might create a spark. Evacuate everyone in the area and keep others away.